Considering how delicious it is, saganaki is a surprisingly simple Greek recipe, at least in its basic form. There are many variations out there, but the simple cheese version is immensely popular. Saganaki is written as σαγανάκι in Greek and pronounced sah-ghah-NAH-kee. The recipe takes its name from the pan in which it's made: the sagani, a two-handled pan made of many different materials. If you don't have or can't find a sagani, you can use a small paella pan, a small cast-iron skillet, or even an oval au gratin dish. 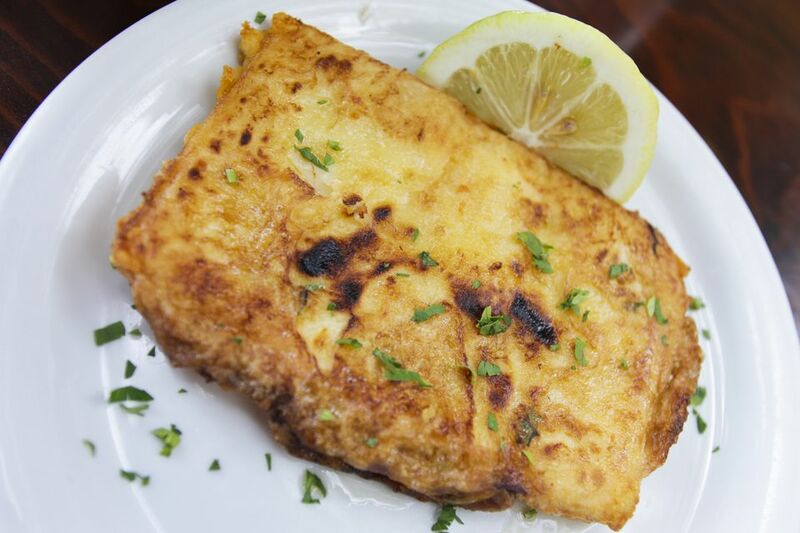 Serve saganaki as an appetizer, hors-d'oeuvres, or as part of a meal made up of a variety of mezethes or appetizers. Saganaki goes well with ouzo or wine, olives, vegetable mezethes, tomatoes, and crusty bread. Cut the cheese into slices or wedges 1/2-inch thick by 2 1/2 to 3 inches wide. Each slice must be thick enough that it doesn't melt during cooking. Moisten each slice with cold water and dredge it in the flour. Shake off any excess flour. Heat about 1 tablespoon of the oil over medium-high heat in a sagani or small heavy-bottomed frying pan. Cast iron works best. Sear each cheese slice in the heated oil until it's golden brown. Flip the slice midway through to brown both sides evenly. Serve hot with a last-minute squeeze of lemon juice. A sagani is a two-handled pan made of many different materials. If you don't have or can't find a sagani, you can use a small paella pan, a small cast-iron skillet, or even an oval au gratin dish. The key to success with this dish is to get the oil as hot as possible before cooking the cheese, but don't let it start to smoke. Use a firm cheese that will hold up against the heat. Authentic Greek cooking usually uses graviera, kefalotyri, or kefalograviera. Halloumi is traditionally used in Cyprus, while chefs on the island of Chios prefer mastello. You can also use pecorino romano in a pinch. To create more of a batter coating, you can dip the floured cheese into a beaten egg before frying. If you enjoy a little pepper, add some freshly ground black pepper to the flour before dredging the cheese. For a flaming version of saganaki, transfer the finished cheese to a clean sagani or skillet. Pour a shot of ouzo over it and light it with a match, then douse the flames with the lemon juice. This isn't a Greek tradition, but it can be a showstopper at gatherings and parties.